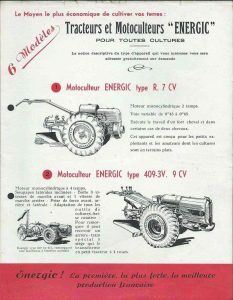 Available from late 1938 in both 5cv and 7cv 2 stroke UK market and 7 cv French domestic market. Engine/Moteur. Two stroke, single cylinder, specifically built for this motoculteur/tracteur. Cylinder. Manufactured of special heat conducting alloy, fitted with a high grade cast iron sleeve/cylinder lining. Crankshaft. Mounted on roller bearings. Connecting rods. Bearings, very large on roller bearings. Cooling. By flywheel fan, driving air into hood surrounding the cylinder. All transmission and reduction gears where lubricated by turning in a oil bath reservoir. Lubrication. 2 Stroke oil 8% oil in petrol. Main Frame. Cast in one piece, enclosing all transmission and reduction gears in a bath of oil. 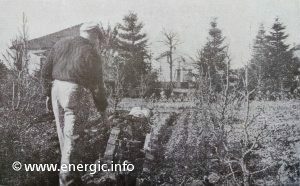 Energic motoculteur R 5cv/7cv working in the garden. Steering Handles. adjustable in all directions. Hitch. Patented swinging drawbar allowing the plough to be offset. Wheels. 68.6 cms or 66 cms (27 inches) in diameter. By reversing them three overall widths are obtained, i.e. 46 cms (18 inches) – 56 cms (22 inches) and 66 cms (26 inches). Fuel tank. Capacity of 7liters (1 and 1/2 gallons), consuming about 4 hours per gallon. Efficient silencers and air cleaners are fitted, and a belt pulley forms part of the engine/moteur fly-wheel. With a average consumption of 1.5 litres per hour. Ploughing depth. 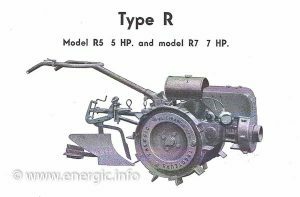 Between 4 and 8 inches (10 cms to 20 cms) dependent upon the soil condition.The type R used Energic’s patented swinging drawbar allowing plough to be offset. 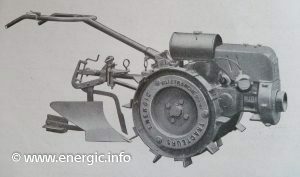 The R7 Patissier engines/moteur 7cv remained in production for a long period eventually being available in the 207, 217 and 227 ranges up of 1950/2. 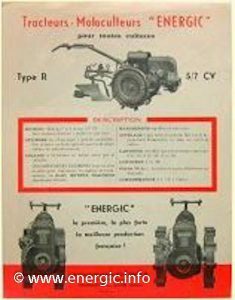 Energic motoculteur R 7 7 cv brochure dating from 1946/7.